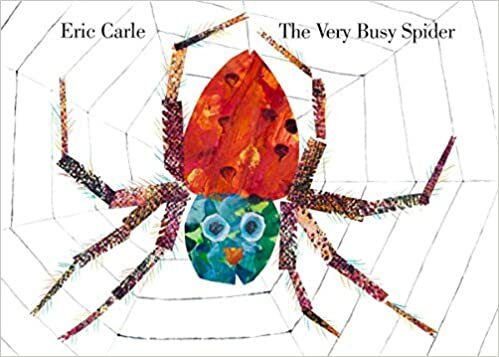 We wrapped up spider week of the Virtual Book Club for Kids with The Very Busy Spider by Eric Carle! This was another play it by ear week. 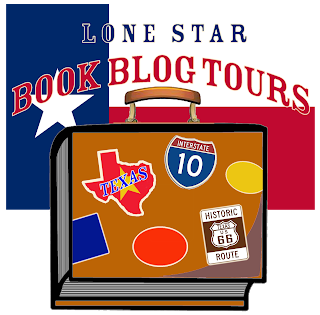 My husband was out of town for military training, so that made the week feel even longer as well as Jackson going through a growth spurt and bad teething again! However, we ended up having a great selection of other books to go along with the theme and the weather has been really nice lately, so we spent more time doing things outside or simply playing with play doh, which in a lot of ways is more fun than anything I could have planned! 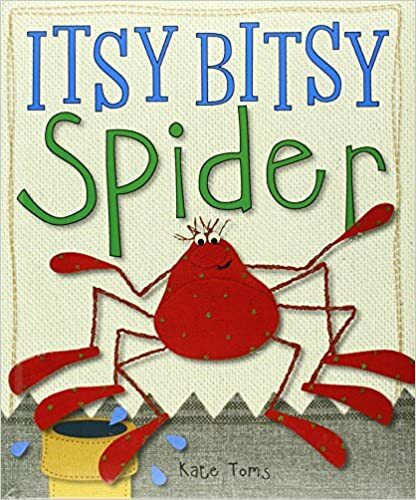 The Very Busy Spider at first glance can appear overly simplistic, but this is a beautifully illustrated story that works great for babies and toddlers as an introduction to various farm animals and the specific sound each one makes as well as preschoolers and young children who will appreciate the spider's message of determination and focus. 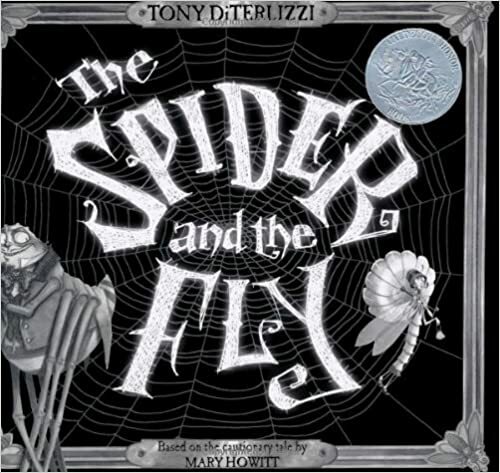 The spider spends her day spinning a web as animals approach her with suggestions of doing other activities. Rather than becoming distracted, she continues her work and eventually spins a beautiful web that allows her to catch her meal and rest. 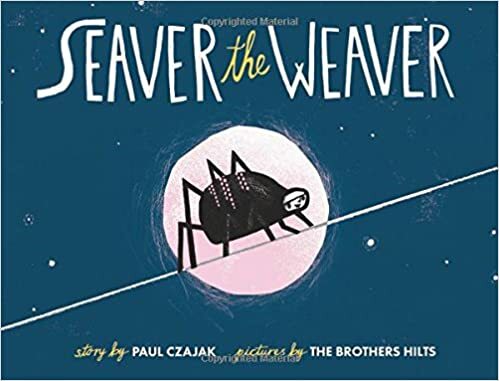 This is an excellent pre-reader or early reader book to share because of its use of repetition and easily identifiable animals. 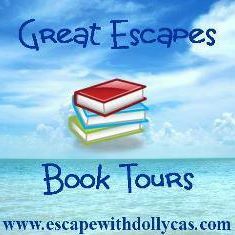 There are several different formats of this book available. 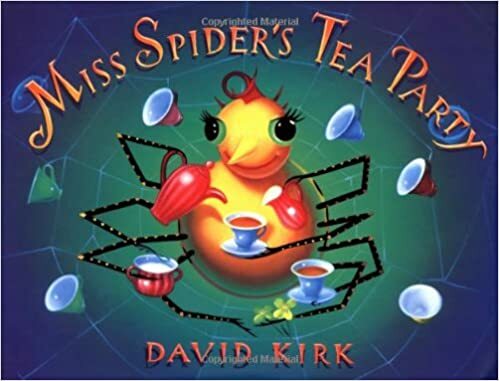 I would strongly suggest the board book version, which offers a multi-sensory experience, as the spider's web is made from string that children can touch and feel as it grows to completion. 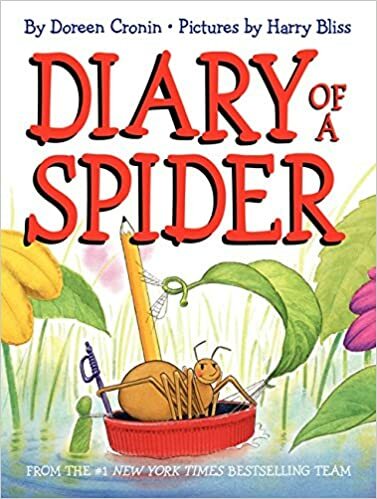 The paperback version features lift-the-flaps over the picture of the spider and her web, which I didn't feel added anything meaningful to the story, except for perhaps a peek-a-boo approach to seeing the size of the web increase. We began the week with some simple retelling play of Charlotte's Web by E.B. White. 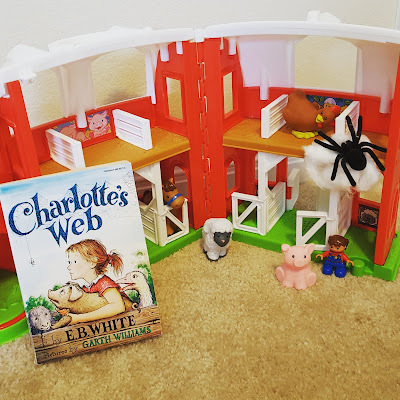 I had read this out loud to the boys over the summer while they ate lunch, so we reenacted some scenes in the story such as when Wilbur meets Charlotte for the first time or Fern visiting all the animals and watching them interact with each other. 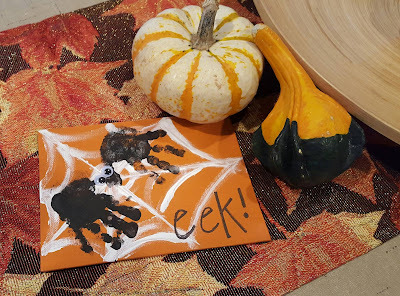 It looked more like Arachnophobia, but it is getting close to Halloween after all! 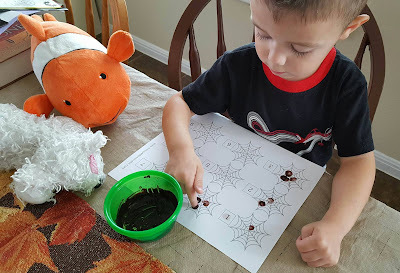 Another day Maddox did this great finger painting math activity from Messy Little Monster to count out spiders on the webs. He had a lot of fun getting a little messy and counting out the spiders that he made. Artsy Momma had an awesome printable for letter matching that I'm honestly surprised Maddox completed. I'm convinced it was the Scrabble tiles, which we used so he could work on matching uppercase letters to their lowercase counterpart. Obviously, the letters that look quite similar whether upper or lowercase where easier for him, but it was fun to watch him figure out the others as the choices became smaller. This was a great resource for this week! We took advantage of this gorgeous weather to spend time outside and made numerous bike rides and walks to our neighborhood playground. And of course, I brought along some books, which didn't always get read, but they were looked at! 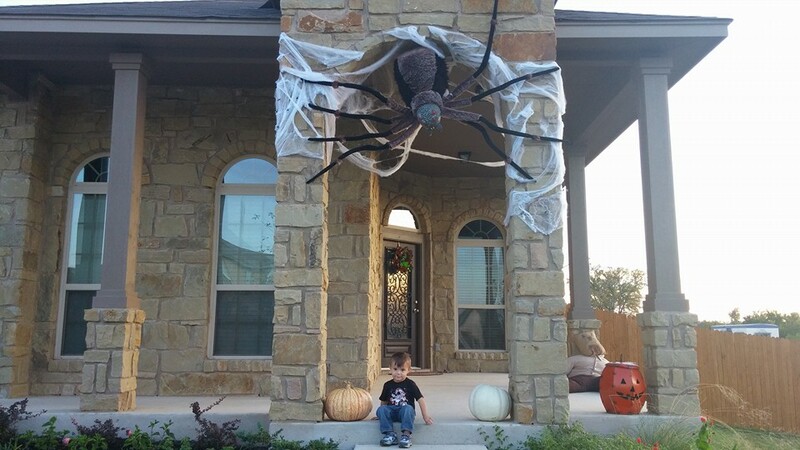 Last year, our neighbors down the street put up a huge spider as part of their Halloween decorations. It is out again this year, so I can't believe I didn't think to retake a new picture with the boys underneath it! Maddox LOVES this thing! 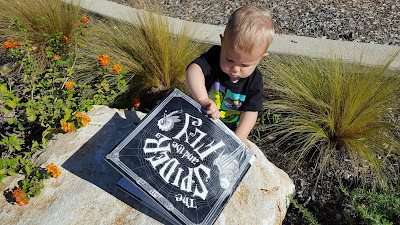 For Maddox's first Halloween in 2013, I used his hand prints to create a spider that is absolutely adorable and used as decoration each year. This spider art would make a great activity regardless of your child's age. Additionally, I recently came across Fatherly, a website geared towards obviously men, but they include lots of information about understanding parenting through a male perspective. As my husband gets closer to deploying, I find myself confronting the idea that I will be also be assuming the dad role as well and have really found some of their articles highly entertaining and useful as I try to figure out raising two little boys alone for a while. 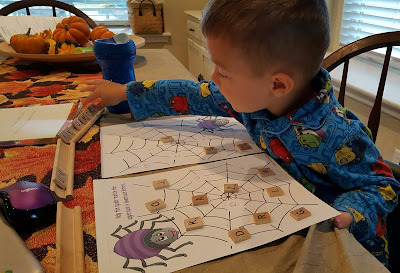 They recently included an article about building a spider using cardboard and duct tape, which is definitely something I want to keep in mind when the boys get older because I'm sure they would love making a few of these to put around the house during Halloween! So that was our short and sweet spider week! Did you do any activities? 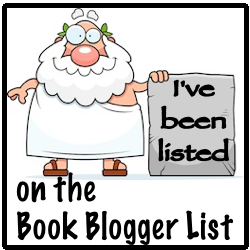 Please share in the comments because I love getting inspired by new ideas! Next up...celebrating nighttime with Time for Bed by Mem Fox!